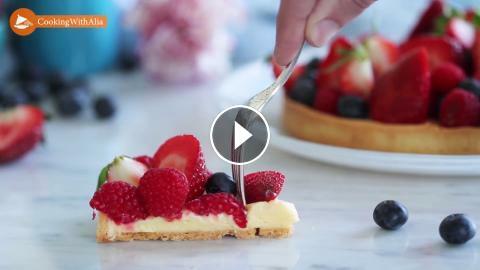 For this of recipe with shortcrust pastry, we will prepare a tart with berries. 1- On a floured work surface, spread out your dough with a pastry roll about 2-3mm thick. 2- In a pastry ring 22 cm in diameter, insert your pie dough and cut the excess dough from the edges. 3- Place on a baking sheet lined with parchment paper and place in the refrigerator for 30 minutes. 4- Preheat your oven to 160 ° C. Using a fork, prick your pie, place a baking sheet of parchment paper on top and put chickpeas on top. 5- Bake for about 25 minutes until your dough is golden brown. 6- Pour the milk into a saucepan and add the lemon zest. Place over medium heat and bring to a boil then turn off the heat and let infuse 10 minutes. 7- In a bowl, place the egg yolks, sugar and salt and mix with a whisk until you have a lightly frothy mixture. 8- Add the cornflour and mix until you have no more lumps. 9- Pour over the hot milk little by little while mixing. 10- Put everything in the pan, put it on medium heat and cook stirring with the whisk until the cream thickens. 11- Remove from heat, add the butter and mix until it is completely melted. 12- Put the pastry cream in a bowl, cover it with a film of food directly in contact with the surface then let cool. 13- Using a whisk, whip the custard until it has a smooth texture, then place it in the pie shell and spread evenly. 14- Place your red fruits on it. Serve chilled.